As the new season approaches for the Buffalo Bills, there are two decisions I can see being debated. The two decisions go hand in hand in a way. Odds makers appear to think that the Buffalo Bills are headed for another mediocre season. Most Bills fans would agree with this assessment. So lets dig into the decisions. The Bills currently have one extra first round pick in the 2018 draft thanks to the trade with the Kansas City Chiefs last year. The Bills got one extra second round pick thanks to the Sammy Watkins trade, and an extra third with the Ronald Darby trade. The Bills could still net extra third and fourth round picks through the NFL compensatory draft pick system. The Bills don’t qualify for picks at this point because they signed more free agents than they lost. The Bills signed seven free agents and lost five (Note: free agents like Gerald Hodges signed later in free agency don’t count in the compensatory draft system). The Bills lost two free agents that could bring them an extra third and fourth round pick. This is because Stephon Gilmore and Robert Woods signed lucrative deals with the New England Patriots and Los Angeles Rams respectively. The Seven free agents signings that count for the compensatory system are: S-Micah Hyde, S-Jordan Poyer, K-Steven Hauschka, FB-Patrick Dimarco, WR-Andre Holmes, G-Vlad Ducasse and DE-Ryan Davis. If the Bills cut four of these players by week 10 then they would get the extra picks. If the season looks like it’s headed for another 7-9 season then this appears to be a no brainer four of these players need to go. The four most likely would be: Davis, Holmes, Ducasse and Hauschka or Dimarco. For fun let’s say this happens. This leads to the second dilemma. 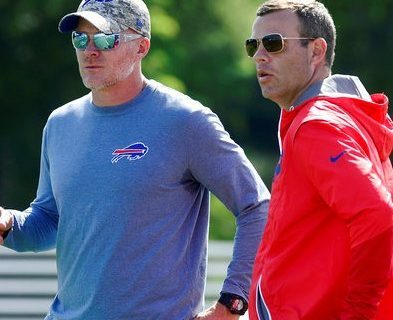 If the Bills have two first round picks, two seconds, three thirds and two fourths, they have great ammunition heading into the 2018 draft. Do you use the extra picks to trade up for a potential franchise QB or do you keep Tyrod Taylor and basically fix every other hole on the team? Most might say trade up for the QB. It’s not that simple. First nothing is certain that all of the good QB’s are even coming out in the 2018 draft. Rumors already out of Los Angeles say that Sam Darnold is considering staying two more years at USC. The other problem is, it looks like three teams desperate for a QB are going to be worse than the Bills. The NY Jets, Cleveland Browns and San Francisco 49ers all look to be in worse shape heading into this season, and those teams would certainly take a franchise QB if available. So trading up to get Sam Darnold seems highly unlikely. The best you might be able to do is trade up for the third best QB in the draft. That’s if the 49’ers get Kirk Cousins to be their QB next year. At this point I’m leaning towards cutting the players to get the picks and using the picks to fortify the roster and not get a QB. That being said, it’s only August and I reserve the right to change my mind several times before the actual decisions need to be made.